A large backplane connector array, over a meter in length and comprised of dozens of individual connectors, was being manually inspected to measure the true position of hundreds of individual signal pins and shield pins, relative to a specified datum point on each connector. This large backplane connection system is used in computer servers and other highly-connectorized systems. Each connector in the array must be inspected individually. 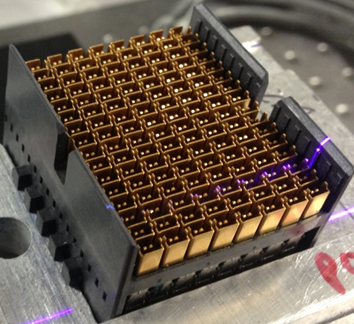 The manual inspection of a large backplane connector array took 8 hours, with a high potential for inspection error. The inspection process was a major production bottleneck and any inspection error could lead to the mating connectors not engaging properly on the backplane connector array or missing a critical operational signal, leading to a major re-work problem after installation. VAIA designed a custom inspection system to automatically measure the True Position of every signal pin and shield in each backplane connector. 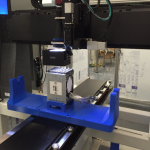 This system required absolute stability and tight functional integration of both high resolution machine vision and 5 motion axes control to inspect each individual connector. The expected connectors and the expected positions of the pins and shields, relative to the connector’s datum point, are trained by importing a CAD model of the connector and backplane array. The backplane array is moved into its inspection position on an X-axis stage below the camera. 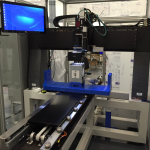 The Y-axis and Z-axis motion systems are mounted to a granite gantry to move the imaging system to each connector while minimizing vibration. The entire connector backplane frame is moved through the point of inspection and does not require any additional handling once the inspection process begins. Designed, fabricated, and integrated in-house. Inspection training based on the CAD import of each backplane and connector layout. Detailed graphics and mapping to display the inspection results for the operator and for reporting. 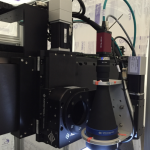 Tight integration of vision inspection and precision motion control over a large area and with multiple motion axes. The time it takes to go through the inspection process was reduced from 8 hours to 22 minutes for a large backplane array, greatly improving the production throughput, as well as inspection accuracy and repeatability. The ROI was less than 1 year for this system. By improving inspection efficiency, production capacity and product quality have both improved and the inspection process is no longer a bottleneck.